For a cheap way to drill straight holes you can’t beat it. More for the hobby woodworker though. Unlike everything else I have bought from Harbor Freight assembly was very simple. My only complaint is the power. On the lowest speed(620rpm) I can stop the chuck in my hand. Although with a 1” forstner bit it will go right through oak/ walnut without any trouble. Anything bigger and you might as well give it up. But, for 69.99 then a 20% coupon I can’t complain. Just don’t expect arm breaking torque. Good review, I have a couple of those drill presses, and they work well for me. It’s nice to the chuck closes down to 0 I can use very fine drill bits in this press. I just bought mine about 2 weeks ago for 49.00. It does its job but not precise it has a slight wobble upon entering the wood. It’s good for small jobs where accuracy does not matter. What is the power rating on the motor? How far does the quill travel? What is the largest size bit the chuck will accept? Is the chuck keyless? 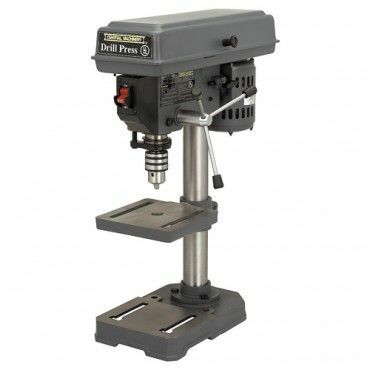 What is the overall capacity of the drill press? Good review. Thanks for the extra info. I have the one with the keyed chuck. I have had no problems and it is centered and square. The only thing I dont like it the plastic depth guide. I just recently got this drill press as well. I actually got it for $25. It wasn’t shipped with a chuck key, which was easily replaceable also at HF. It was not my ideal choice, but for $25 how can you say no. I have so many other tools to buy, but so little money…ha. I am brand new to woodworking, so for now we are good to go. I was able to drill a 1.5” forstner bit through mahogany, oak, hickory, walnut, and of course pine. It was a slow process and would bind from time to time since I needed a slower speed for the bit, but still got the job done. -- Blessed to have a wife who supports my addiction...Hobbies! I just picked one of these up on sale for $50. It went together pretty quick and after the usual round of adjustments and tweaks you need on any HF tool it was ready to go in about half an hour. Unfortunately the motor just couldn’t keep up with my first project (used a 3” hole saw to cut some discs out of 1/8” hardboard.) Every time I’d start to cut if I didn’t go painfullyy slow it would just bog down and stop. I’ve gotten bad/weak motors on their stuff before, so I don’t know if its just too underpowered for what I need (which I think is quite likely, that hole saw has some heft to it, may just be too much mass for that little guy), or I just got a bad unit, but either way I plan to return it next time I go out and move up a step.